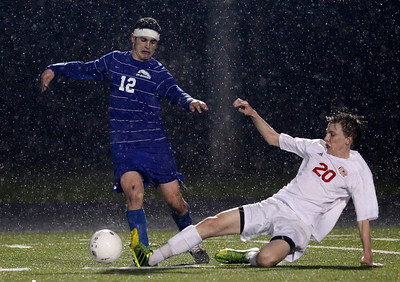 Kyle Grillot - kgrillot@shawmedia.com Marian Central sophomore Bryan Hart (20) slides to attempt to gain control of the ball from Vernon Hills senior Jeremy Cohen during the second half of the class 2A boys soccer semifinal match between Marian Central and Vernon Hills Wednesday, October 30, 2013. Vernon Hills won the match 10-0. 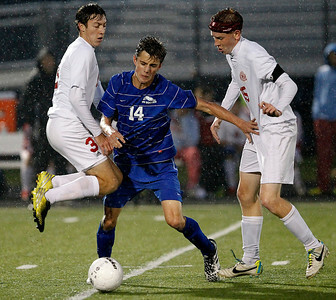 Kyle Grillot - kgrillot@shawmedia.com Vernon Hills senior David White (14) fights through Marian Central junior Connor Hull (left) and senior Riley Blaz during the class 2A boys soccer semifinal match between Marian Central and Vernon Hills Wednesday, October 30, 2013. Vernon Hills won the match 10-0. 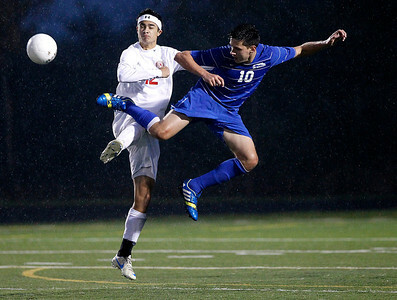 Kyle Grillot - kgrillot@shawmedia.com Vernon Hills junior Ilya Kravtsev (10)jumps to kick the ball away from Marian Central junior Jordan Peterson(12) during the class 2A boys soccer semifinal match between Marian Central and Vernon Hills Wednesday, October 30, 2013. Vernon Hills won the match 10-0. Kyle Grillot - kgrillot@shawmedia.com Marian Central freshman Connor stiscak (2) and Vernon Hills senior Ryan Bryson (back) fight for control of the ball during the second half of the class 2A boys soccer semifinal match between Marian Central and Vernon Hills Wednesday, October 30, 2013. Vernon Hills won the match 10-0. 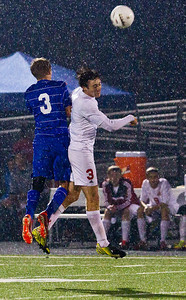 Kyle Grillot - kgrillot@shawmedia.com Marian Central junior Beau Meintz (5) flies through the air while attempting to gain control of the ball from Vernon Hills junior Brad Burrows (18) during the second half of the class 2A boys soccer semifinal match between Marian Central and Vernon Hills Wednesday, October 30, 2013. Vernon Hills won the match 10-0. 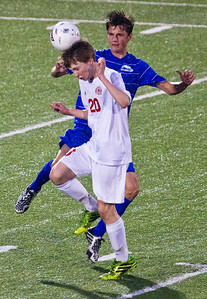 Kyle Grillot - kgrillot@shawmedia.com Marian Central sophomore Fermado Tapia tries to stop Vernon Hills senior Nick Bryson (21) from passing the ball during the class 2A boys soccer semifinal match between Marian Central and Vernon Hills Wednesday, October 30, 2013. Vernon Hills won the match 10-0. 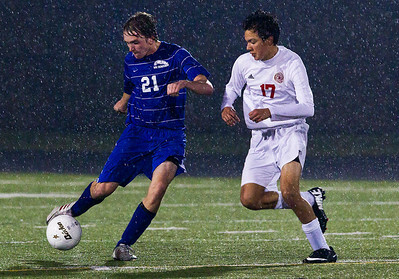 Kyle Grillot - kgrillot@shawmedia.com Marian Central sophomore Fermado Tapia (17) kicks the ball away from Vernon Hills senior Nick Bryson (21) during the class 2A boys soccer semifinal match between Marian Central and Vernon Hills Wednesday, October 30, 2013. Vernon Hills won the match 10-0. 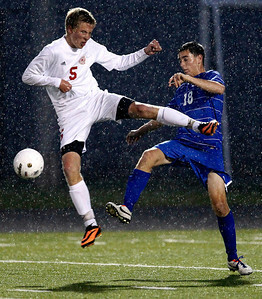 Kyle Grillot - kgrillot@shawmedia.com Vernon Hills senior (left) fights through Marian Central junior Connor Hull (right) and senior Riley Blaz during the class 2A boys soccer semifinal match between Marian Central and Vernon Hills Wednesday, October 30, 2013. Vernon Hills won the match 10-0. Kyle Grillot - kgrillot@shawmedia.com Marian Central sophomore Bryan Hart tries to hold Vernon Hills junior Ilya Kravtsev (10) as he passes the ball during the class 2A boys soccer semifinal match between Marian Central and Vernon Hills Wednesday, October 30, 2013. Vernon Hills won the match 10-0. 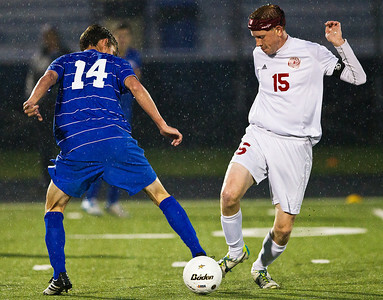 Kyle Grillot - kgrillot@shawmedia.com Vernon Hills senior David White (14) and Marian Central senior Riley Blaz fight for control of the ball during the class 2A boys soccer semifinal match between Marian Central and Vernon Hills Wednesday, October 30, 2013. Vernon Hills won the match 10-0. 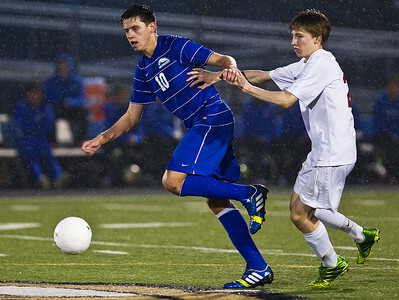 Kyle Grillot - kgrillot@shawmedia.com Marian Central sophomore Fermado Tapia (17) cant stop Vernon Hills senior Nick Bryson (21) from controlling the ball during the class 2A boys soccer semifinal match between Marian Central and Vernon Hills Wednesday, October 30, 2013. 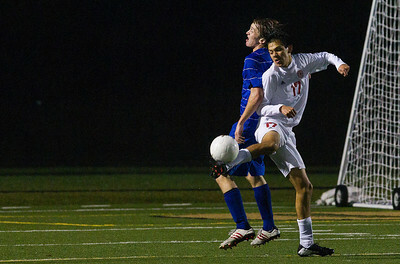 Vernon Hills won the match 10-0. 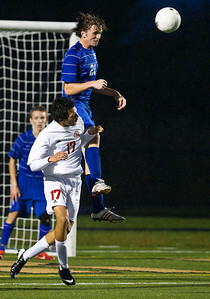 Kyle Grillot - kgrillot@shawmedia.com Vernon Hills senior Caleb Shaw (2) jumps to try to stop Marian Central junior Jordan Peterson from passingthe ball during the class 2A boys soccer semifinal match between Marian Central and Vernon Hills Wednesday, October 30, 2013. Vernon Hills won the match 10-0. 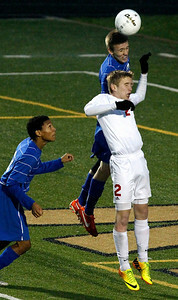 Kyle Grillot - kgrillot@shawmedia.com Vernon Hills senior David White (14) misses a shot at goal during the class 2A boys soccer semifinal match between Marian Central and Vernon Hills Wednesday, October 30, 2013. Vernon Hills won the match 10-0. 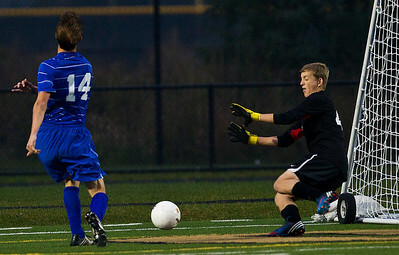 Kyle Grillot - kgrillot@shawmedia.com Marian Central sophomore Bryan Hart heads the ball away from the Vernon Hills defense during the class 2A boys soccer semifinal match between Marian Central and Vernon Hills Wednesday, October 30, 2013. Vernon Hills won the match 10-0. 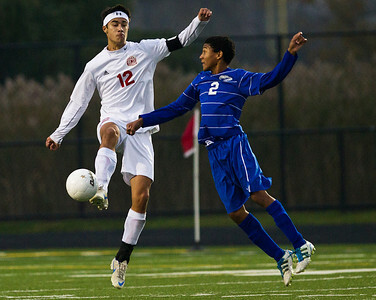 Marian Central sophomore Fermado Tapia (17) kicks the ball away from Vernon Hills senior Nick Bryson (21) during the class 2A boys soccer semifinal match between Marian Central and Vernon Hills Wednesday, October 30, 2013. Vernon Hills won the match 10-0.